The nursing station is the heart of any medical facility, from a bustling hospital to a modest private practice. Having the right medical casework design is essential to ensuring that medical professionals have access to the resources they need so records can be completed and filed accurately. A well-designed station allows RNs, CNAs and other medical professionals to provide optimal care to patients. When designing such a space, use these tips to ensure that it is as efficient as possible. The nurse station should be placed so that it is convenient for nurses to access all important areas of the facility. A centrally located station with patient rooms and therapy stations radiating out from it is often a convenient choice, but some facilities may be better served by having the station located near the front so that employees can see patients as they enter. Leave plenty of space behind the nurse station for people to move around and get work done. Leave space outside the station as well so patients and doctors can get to the station easily. Remember that patients visiting the station may have limited mobility and need a little extra space to move. Also allow ample space for storage shelves and other necessary furniture and equipment. Make sure the nurse station is designed in a way that allows employees to see what’s going on in the facility. To accomplish this, keep lines of sight intact when designing. Avoid high walls that can obstruct the line of sight, opting instead for a low counter or desk that encircles the station on all sides. The nursing station needs to provide more than just a place for nurses to sit. They also need to perform important tasks such as patient intake and handle medical documents. Make sure that the station has adequate room for employees to spread out and work, as well as office supplies, and storage space for files. There should also be a break room or other space where nurses can get some privacy if they need it. In addition, pay attention to the practical needs of the nursing station. Make sure that there is enough light for everyone to do their work and enough electrical outlets to power all the necessary equipment. The above sections are just some suggestions to get you started. While we have experience working directly with project owners who know exactly what they want, we are usually part of a much larger project team. 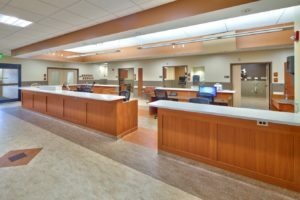 The image above of the nurse station we built for the Nicholas H. Noyes Memorial Hospital was designed by Gardner PLUS Architects, PLLC, prior to being acquired by LaBella Associates. Are you designing a nurse station for your healthcare facility? Many engineers and architects bring in Beaver Creek Industries during the design phase of projects as consultants to the Design Team. Because of what we can build, we offer a lot of insight to promote constructible and on-budget designs. For a consultation, contact us at 607-545-6382 or bci@beavercreekindustries.com.